Journeys Is This The Most Creative Kaiseki In Tokyo? 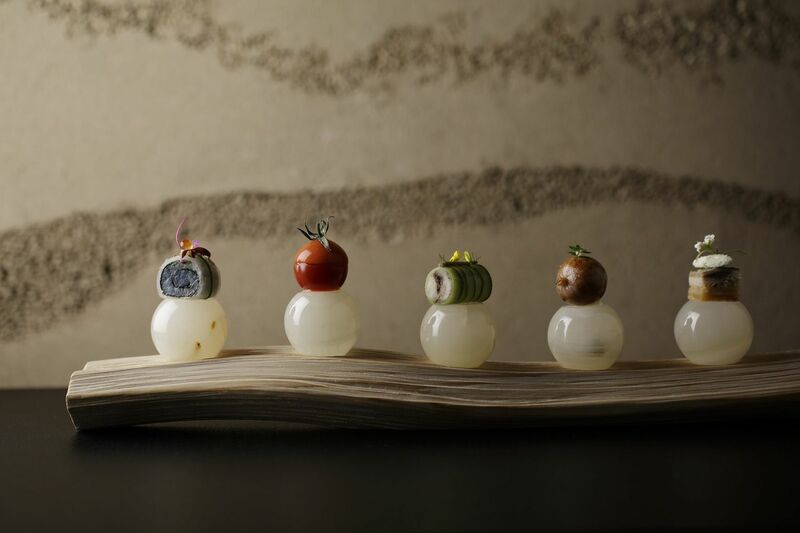 Is This The Most Creative Kaiseki In Tokyo? Executive chef Noriyuki Hamada of Hoshinoya Tokyo talks us through the making of his fish-only kaiseki that's delicate and delicious at the same time. A visit to Tokyo is likely to involve a delicious meal of fish, whether it's a breakfast bowl of chirashi after witnessing the tuna auction at Tsukiji market (catch the original location before it moves to Toyosu in October) or a traditional sushi dinner at Sushi Saito, Sukibayashi Jiro or one of the other stalwarts. If you're already well-versed with the infinite preperations of fish that one encounters in Japan, a visit to Hoshinoya Tokyo's restaurant will still manage to surprise you. Transforming Japanese ingredients with French techniques while thinking outside the box, executive chef Noriyuki Hamada changes your perception of how a meal of fish is prepared and enjoyed. One of Japan's most talented chefs—he bagged the bronze Bocuse d’Or, an internationally-acclaimed competition—chef Hamada deftly pushes the envelope while still injecting tradition to come up with his signature fish-centric kaiseki offering at Hoshinoya Tokyo. Fascinated by fish "destined for the garbage", as well as an avid forager, he shares how he comes up with one of the most creative and intriguing kaiseki dinners to come our way. Why is kaiseki important to you and what would you like others to take from this dining experience? Noriyuki Hamada (NH) The spirit behind kaiseki is very important. A long time ago, back when food was scarce, monks put hot stones into the inner part of their kimono to warm their stomachs and repress their hunger, which is where the word “kaiseki” derives from. I strongly feel that these old traditions and the thoughts behind them are extremely important. When I was thinking of a dish that would maintain the spirit behind kaiseki, whilst being understood in today’s modern world, the ‘Five Flavours of Delight’ dish was born. This dish represents five meticulously designed items representing the five flavours (sour, sweet, bitter, salty, and umami), which are each placed on stones individually heated to ideal serving temperatures. You call your style of cooking “Nippon Cuisine”. Can you describe the philosophy behind it? NH The philosophy behind Nippon Cuisine is “Japanese ingredients multiplied by French technique" and “ingredients multiplied by ingredients”. For the first point, I use traditional Japanese ingredients that are familiar to the Japanese but use cooking techniques that differ with traditional techniques to create something that has never been seen or eaten before. By using techniques that are uncommon for Japanese ingredients, I can create a new, delicious dish. Many Japanese ingredients that go well together are usually grown during the same season, and that is why they are commonly combined. What I want to do is to analyse those combinations and create new ones. There are many different kinds of ingredients that work well and are yet to be put together. That is the essence of the "Nippon Cuisine" that I envision. During our meal at Hoshinoya Tokyo, everything was made with fish. Why the fascination with fish? NH Japan has a long and deep culinary history with fish, and the care and thought that goes into fish is extraordinary. From an outsider's point of view, it is also seen as one of Japan’s culinary strengths. The reason why travellers want to eat sushi or tempura when they come to Japan is because these dishes are some of the tastiest ways to enjoy fish. Indeed, you taste the care of those who catch, sell, and prepare the fish. There is that cultural aspect that I respect but I also focus on fish because of its purity; I only want to cook using all-natural ingredients. Kaiseki's inherent seasonality and your interest in foraging allow you to use lesser-known ingredients. What are some of the new discoveries that you've used to date? NH At the end of April, I went to the mountains to forage uwamizuzakura (Japanese bird cherry) flowers, leaves, stems, and mountain grass. I pickled the flowers in syrup, which I will then used for some desserts. I also steamed the leaves before using it in other dishes. These simple touches add a pleasant, flavourful accent. Besides the Japanese bird cherry, I plan to use ingredients such as tamushiba, the flowers of the willow-leafed magnolia, and kihada (Amur cork tree), which I believe are not very well-known as cooking ingredients.